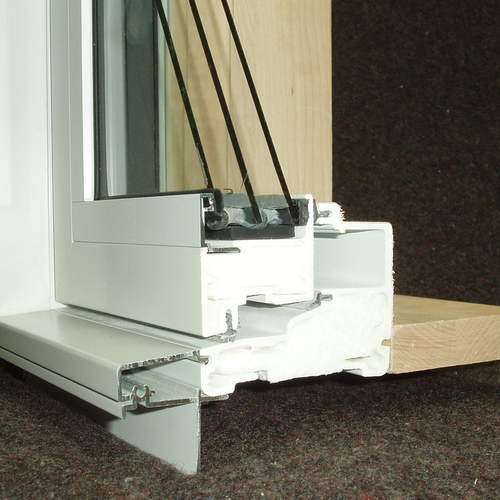 Strike up the band: we have – finally – achieved the Passivhaus standard with Unilux windows! Marc Rosenbaum, our energy consultant, ran the Passive House Planning Package (PHPP) energy modeling software and arrived at a heat load of 4.74 KBTU/sq. ft./year, a mere 0.01 below the 4.75 limit. Talk about a photo-finish squeaker! Yes, being just 0.01 below the limit is too close for comfort. Marc has entered several PHPP assumptions that, upon review by a still-to-be determined independent Passive House certifier, may be modified or disallowed. 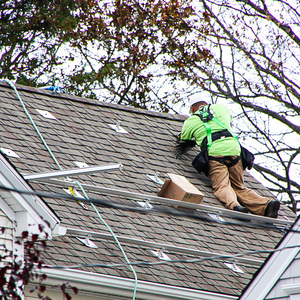 I will discuss in a future blog additional steps we can consider to further lower the annual heat load and provide flexibility for the certification review. Still, we are very pleased that the EdgewaterHaus design is sufficiently robust to meet the Passive House heat load standard, which is much harder to attain in a northern climate than the primary energy criteria. A Passivhaus building relies on the sun as the primary engine to heat the house. South-facing windows play a critical role. Today’s blog explores why using Unilux windows has been so challenging, and how changes of just one tenth or even a few hundredths of a percent in window performance specifications, changes seemingly so minute that they would appear to be inconsequential except in judging the performance of an Olympic athlete, yield significant energy performance consequences. Certified products feature exceptional energy performance, making it easier for a designer to select key building components to attain the Passivhaus standard. (But only if the designer can read German! You see, the Passivhaus Institut and the Passive House Institute U.S. have been so busy feuding with each other that neither has taken the time or effort to offer users an English translation for certified products!) Hmm. 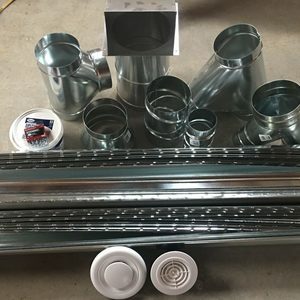 Adding to the challenge was the poor technical support we have received from Hancock Lumber, the local distributor for Unilux windows. Following my previous blog on “window woes,” we met with the president of Hancock Lumber to discuss our concerns about the firm’s lack of technical product knowledge and lengthy turnaround times, but unfortunately that meeting has not led to a discernible improvement. We have had 10 repricings on windows over some four months, most of which I believe could have been avoided if the Hancock team were true salespeople who grasped what our needs were and had the depth of product knowledge to recommend what Unilux configuration would best serve our purposes. 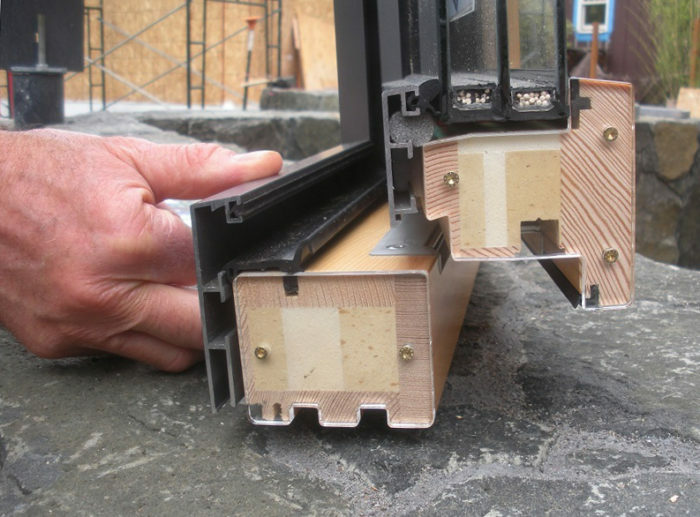 To this day, I don’t believe the Hancock window team realizes that it’s not just about sizing glass to fit into a wall opening, but engineering a high-performance window solution to heat a home. So how did we get to the 4.74 KBTU/sq. ft./year? There were a few enhancements to the building envelope and a concerted effort fine-tuning the windows. To improve the overall building thermal performance, our architect, Chris Briley, added more south-facing glass and reduced the roof overhang above these windows to eliminate any winter shading. Chris assures us that the vegetative trellis he has designed along the south facade will preclude overheating in the summer. (Don’t architects guarantee the integrity of all aspects of their design?) The vegetation will die in the winter, allowing full sun to enter the home. Marc Rosenbaum then added 10 inches of cellulose insulation, raising the ceiling R-value from R-76 to — gasp — R-118. But Chris had to literally stumble onto two key changes to the Unilux windows, overcoming initial “no can do” from the Hancock team: specifying (1) “direct glazing” and (2) optional higher SHGC glazing. Normally two adjacent windows each have their own frames and sash surrounding the glazing. But sashes at ~ R-1 have a much lower insulating value than does the triple-pane glazing at R-5 or higher. Direct glazing allows a single sash to hold two adjacent pieces of glazing. Eliminating one sash between two abutting windows means more higher performing glass, less poorly insulating sash, and thus better overall performance for the entire window assembly. The Hancock Unilux team initially said that direct glazing was not possible. Kudos to Chris for his persistence in getting confirmation from Unilux that direct glazing was indeed possible and beneficial. Similarly, Chris had to ask why Unilux could not provide higher SHGC glass like that offered by some of their competitors. (Note: the Solar Heat Gain Coefficient measures how much solar gain penetrates the windows. 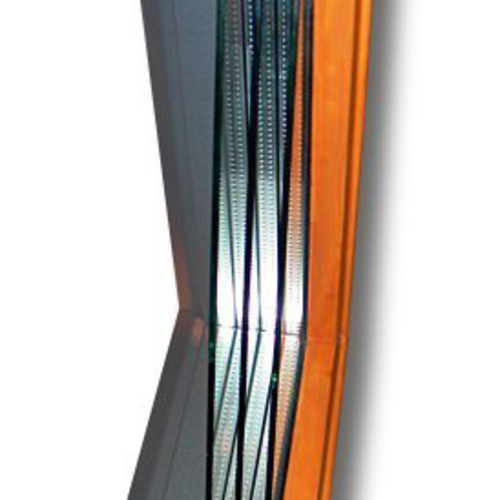 A high SHGC allows more of the solar radiant heat to pass through the glass into the house. A high SHGC is desirable for northern climates, while a low SHGC is better for southern climates where cooling is more important than heating.) 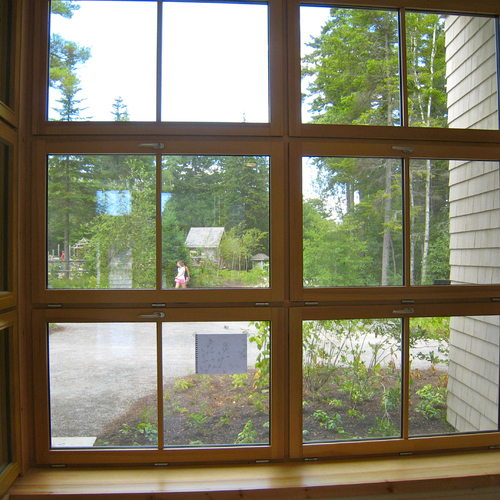 Remember that a Passivhaus building is designed to use south-facing windows as the primary heat source for the home. Of all the adjustments that were made, specifying higher 0.61 SHGC glass vs. the Unilux-supplied 0.5 had the greatest impact on building performance; yes, more important than even the U-factor or the 10 inches of additional cellulose insulation in the ceiling. Higher SHGC is not a standard Unilux option, but Unilux was willing to obtain and install this glazing in our windows. I find it surprising that a premium European window manufacturer like Unilux does not include high-SHGC glazings in its repertoire. Which gets to what I call the importance of “two-decimal place accuracy” on window performance specifications. This table (Window Comparison) compares the performance specifications for the four windows we seriously considered for EdgewaterHaus. Look at the SHGC for the triple-pane windows, which range from a low of 0.5 for the standard Unilux glazing to a high of 0.64 for the Thermotech. That’s a spread of only 0.14. How can such a tiny change in heat gain have much of an impact, you ask? I was just as puzzled. 7,716 KBTU/year using Unilux 0.5 SHGC windows prior to the above changes. 10,075 KBTU/year with the above changes but retaining 0.5 SHGC windows. 14,817 KBTU/year with the above changes, including the higher 0.61 SHGC glazing on main floor south facing windows, standard 0.5 SHGC on all other windows. The benefit of higher SHGC glass outweighs the slightly poorer glazing U-factors. For the Unilux windows, the high-SHGC glass has a U-factor of 0.109, while the standard glass has a U-factor of 0.088 (lower U-factors indicate better peformance). That’s because the higher SHGC allows more heat to enter than the poorer U-factor loses. 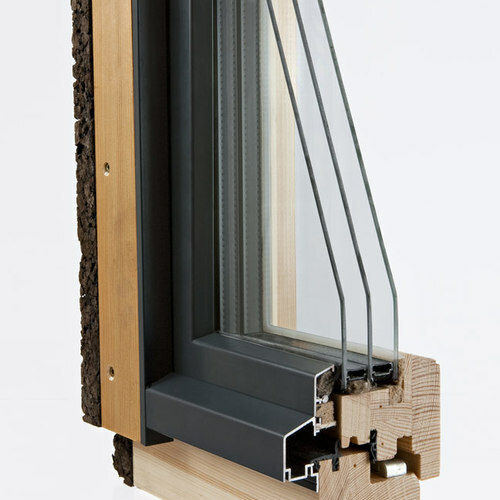 Although both Pella and Unilux are wood-framed windows, the Unilux window incorporates a proprietary thermal break within the wood core (see the photo above) of the frame and sash, substantially improving the U-factor compared to the Pella window. 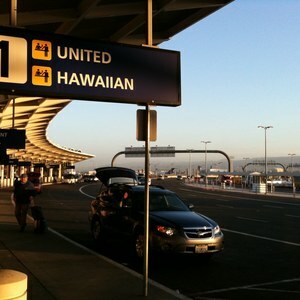 At a cost of $113 per square foot of glazing, that is just short of outrageous, and seriously challenges our checkbook. We could save perhaps $20,000 by going with triple-pane Thermotech Fiberglass or SchÃ¼co windows. We would get equivalent performance, at least initially. But having examined the Thermotech and SchÃ¼co windows very closely, I am certain we would not get the long term durability, nor the esthetic beauty of the Unilux windows. It’s a shame that the technical skills of the local Unilux distributor are not on par with the premium Unilux window they are selling. Hopefully, Hancock Lumber is now be better informed to help future clients. I’m all for more robust window systems but do have a question about the table you referred to that compared window systems. In Europe they use a range of approximately 0 degrees C to + 20 degrees C.
Under NFRC (North America) they use a range of approx -20 degrees C to + 20 degrees C.
For more information on this topic than you knew existed, see this Q&A post, as well as the 29 informative answers posted below the original question: European windows vs. North American windows. i know this is an older post, but the PHI's website does contain english copies of the certifications. the bigger issue is that even in the 4 years of PHIUS's good standing w/ PHI, there was never any real progress on this front. It's good to see APHN and PHI teaming up to resolve this significant leadership gap with the window certification workshop at greenbuild this year. with the price that high - was there any discussion of using pazen or optiwin? we've had optiwin quotes come in well south of that with some really phenomenal glass. What about reflectors and window placement? Given the importance of a 0.1 difference in SHGC reported in the article, I wonder about the significance of window placement, nearby trees, plants, and buildings, and reflective surfaces near the windows. I've read figures that a deciduous tree or shrub will block 20-30% of the light, even when it has no leaves. If this is true, can we count on the architects guarantee of the benignity of the "vegetative trellis"? Would not a few minutes of shading per day from some quantity of branches and twigs overshadow the difference between a 0.5 and 0.61 SHGC rating? A second-story window above a grassy incline gets no significant reflected light. A ground floor window next to a light-colored deck will conduct a substantial amount of reflected light into the home, and even more from clean snow. Wouldn't some wise choices on reflective surfaces have an impact similar to the differences in SHGC values discussed in this article? I recognize that many home owners are not willing to deal with moving shades, overhangs, and reflectors twice a year. To me, movable shading is a useful part of the energy efficiency and comfort equation. Especially since the ambient temperatures are seasonally out of phase with the sun angles, in most locations. Two months before the solstice, in April, I may still want to maximize solar gain, while two months after it, in August, I may want all the shade I can get. As much as I admire the Passivhaus standard and how it has raised the bar for green building in the US, this article has convinced me that the Pretty Good House Standard is the way to go. Of German ancestry, I have a deep respect for German craftsmanship and truly appreciate their remarkable doors and windows. When I visited Germany this spring I could only marvel at their "ka-chick," vault-like doors -- truly remarkable! At the same time, I am a cost-conscious pragmatist. What I see at work here is a financially irrational numbers game. I'd rather build a Pretty Good House and use the money saved to help launch a communal solar or wind farm. 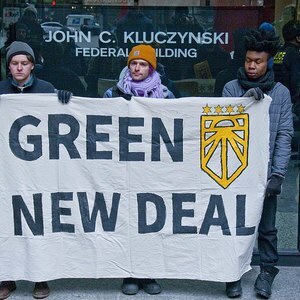 We're facing a global meltdown and capital will become increasingly dear. In this larger context -- the coming global crisis -- wasting money in pursuit of a numbers game doesn't make much sense. The Germans know this and have poured the lion's share of their spare resouces into creating renewable energy infrastructure. We have to make every dollar count, as the Germans do by going for the greatest bang for the buck. Could you point out what the thermal breaks look like? Is it the lightest coloured part that you see? We shouldn't have to scratch and claw details from the window manufacturers, or any other supplier of high quality building products. And then there is the whole question as to which numbers do you use in the PHPP. We know that European numbers don't correspond to N American window numbers, so how much faith do you put into the outputs of the PP? I certainly like the PH concept, but the PGH seems a who lot less complex, and probably less expensive. A thermal break is any material (usually a type of insulation material) with a high enough R-value (that is, a low enough U-factor) to reduce the rate of heat transfer through a structural element. In the photo, the white-colored materials and the yellow-colored materials are thermal breaks. These thermal breaks are surrounded by glued pieces of wood. The core materials have a lower U-factor than the wood that surrounds them. I'm not sure what materials these are; perhaps someone familiar with the Unilux frames and sash can let us know.